For years, we've witnessed small flotillas of gondolas cruising along Venice's back canals to the accompaniment of guitars, an occasional accordion, and O Sole Mio. We never dreamed that someday we'd overcome our city-slicker cynicism and take such a tour ourselves. But when the opportunity presented itself during a Silver Whisper cruise, we thought "Why not?" As long as we were touring the Mediterranean with other people, why shouldn't we cruise collectively (and musically) on Venice's back canals? We joined the Gondola Serenade Tour at a gondola pier near the Piazza San Marco. There, we and the other tour participants stood in line while the tour agency's staff efficiently divided us into small groups and helped us into our gondolas. Within a few minutes, we were headed down a canal that led deep into the sestieri of San Marco and Castello--accompanied by a gondola with a guitarist who played beautifully while a baritone enterained us with O Sole Mio, Santa Lucia, and other traditional Italian (as opposed to Venetian) songs. During our approximately 50-minute trip, we passed landmarks such as the Church of Santa Maria Formosa and the Bridge of Sighs--along with innumerable palazzi, former convents, and private houses. As we passed one house, the gondolier pointed to an open window where a seagull was perched. He told us in Italian that the gull--which had become a local celebrity--visited the apartment twice a day to be fed. Other tourists waved or took pictures from bridges; we waved back. And when the music stopped, we were impressed by how silent Venice could be in August, its busiest time of year, when all we could hear in some places was the stroke of the gondolier's oar and the lapping of water along the boat's hull. The tour finished with our small flotilla of gondolas rowing past the Doge's Palace and into St. Mark's Basin. It was late evening by now, and the sun was about to set. We disembarked from our gondola, and the boat was gone before we could thank the gondolier or offer him a tip--a surprising end to a pleasant, relaxing, and delightful evening. Local travel agencies can sell you tickets for the Gondola Serenade tour, and cruise ships often market the tour as a shore excursion (usually at a higher price than you'd pay if you booked it yourself, since the cruise ship's price normally includes transportation to the departure point from the ship). 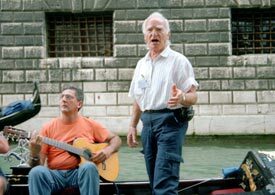 The Gondola Serenade Tour normally provides a boat with musicians for every four gondolas, so you needn't worry being out of the singer's vocal range. If you're traveling with companions, you'll probably find it cheaper and more romantic to arrange a private gondola ride than to book the tour. (The downside is that you won't be accompanied by a singer and musicians.) See our Gallivanting by Gondola article for more information. And if you're on a really tight budget, you can get a relatively cheap (if quick) ride across the Grand Canal in a traghetto gondola ferry. Some people love the tour, and some don't. Over the last several years, we've received two e-mails from readers who were disappointed by the Gondola Serenade Tour, but we also received an e-mail that said: "We loved our Gondola Ride complete with music! What a beautiful way to end our 2-week Med cruise with Emerald Princess!" If you take the tour, we'd be interested in hearing your feedback. You'll find an e-mail link on the Contact Us page at Europe for Visitors.